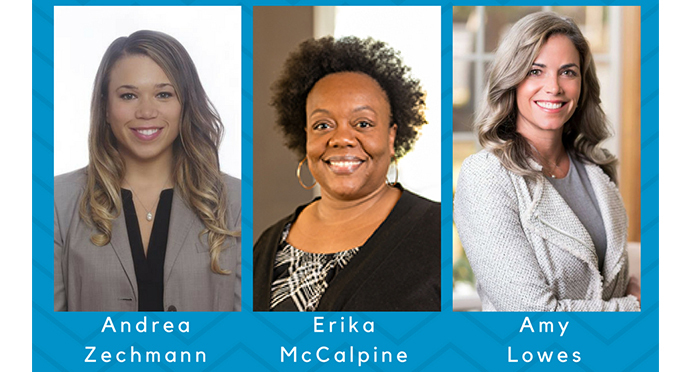 Three new members have recently been added to the board of directors for Healthy Beginnings, a Central Oregon nonprofit that provides free health screenings and referrals for young children with the goal of ensuring they enter kindergarten ready to succeed. Amy Lowes, Erika McCalpine and Andrea Zechmann bring a diverse set of skills and backgrounds to the team. A registered nurse and entrepreneur, Lowes brings years of experience in the healthcare system and small-business ownership to the Healthy Beginnings board of directors. She has deep roots in the community and looks forward to helping the organization continue to be an integral part of the care of the children of the region. McCalpine, a business administration instructor at Oregon State University – Cascades, brings a wealth of knowledge in the fields of human resources, organizational behavior, leadership, ethics and diversity to the board. Prior to entering higher education, she worked for over 15 years for companies including AT&T and Fidelity Information Services. As a branch manager for First Interstate Bank, Zechmann brings strong financial and relationship skills to the board. She enjoys volunteering in the community, previously served on the Central Oregon SMART Foundation’s leadership team and is currently a member of the Sun River Rotary. The addition of three new board members with diverse backgrounds is part of the organization’s ongoing effort to continue to grow, said Bridget McGinn, President of the Board. Healthy Beginnings works with the community and families to ensure that children enter kindergarten ready to succeed. The 501(c)3 nonprofit organization was incorporated in 1997, and for more than twenty years has provided free screenings and referrals to health, education and behavior services for young children and their families. To learn more about attending a screening, volunteering or donating, visit www.myhb.org.